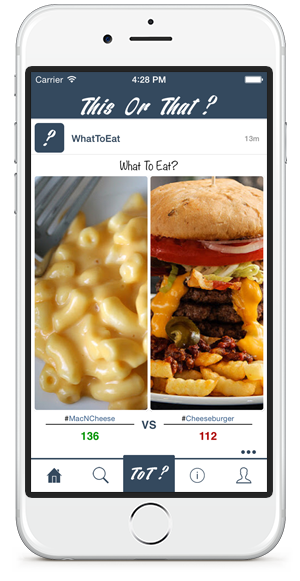 Ask any 2 choices and let your followers vote for one of them! User-friendly design provides an easy and simple use for the users with layered page design. You can easily register with your facebook account and find your friends who also use ToT. 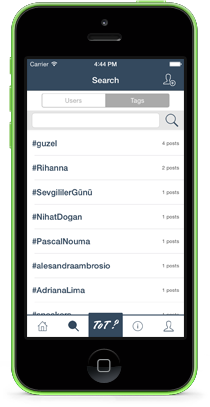 Most followed users and most posted hashtags are listed under search tab. You can easily mention users on your ToTs by putting an '@' sign before their usernames. ToTs can be shared over social networks to provide more impact. If you have 2 choices and no idea, want answers for a though choice; let your friends, family and followers help you. Whenever you need, wherever you are with ThisOrThat. 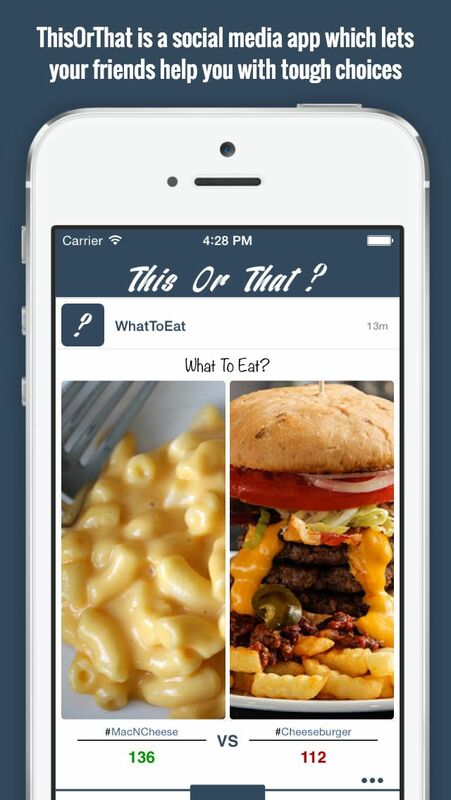 This app lets you ask and respond to any 'This or That' question asked by your friends or any users worldwide. • Going on a date and want some advice for your outfit? ToT That! • Couldn't choose which restaurant you should take your beloved one for your anniversary? ToT That! • Don't know what to eat? ToT That! • Couldn't decide which team to bet? ToT That! 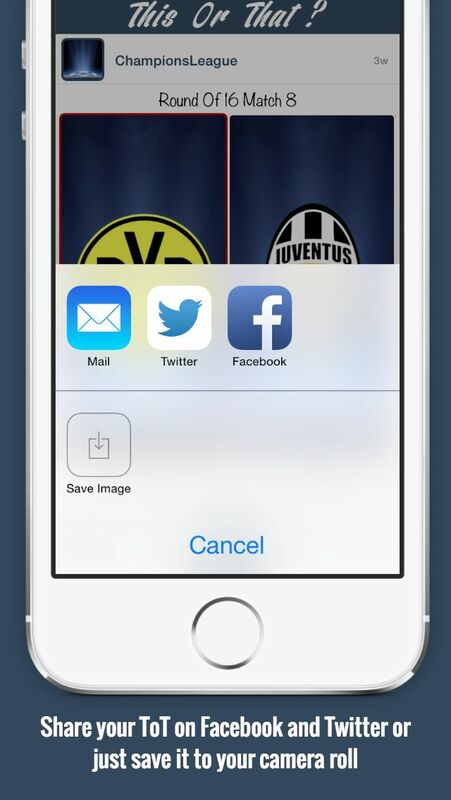 1) Upload your two options, by using your camera or photo library. 2) Write down your question and names of your choices. 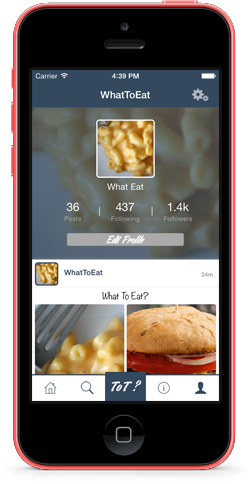 Get instant notifications when your ToT has been voted. You'll be amazed at how easily even your toughest choices can be solved. You'll be helping the world make better choices. Follow your friends, best users, top celebrities and favorite companies to make your voice heard. I know that you do wonder what the meaning of ToT is. In the basic manner, it is the simpliest way of making choice. Let your friends say what to wear today or let’s count how many supporters of your football team among your friends! I like to ask them which one ? This or That? Funniest way of making choice! This app is so amazing for us. 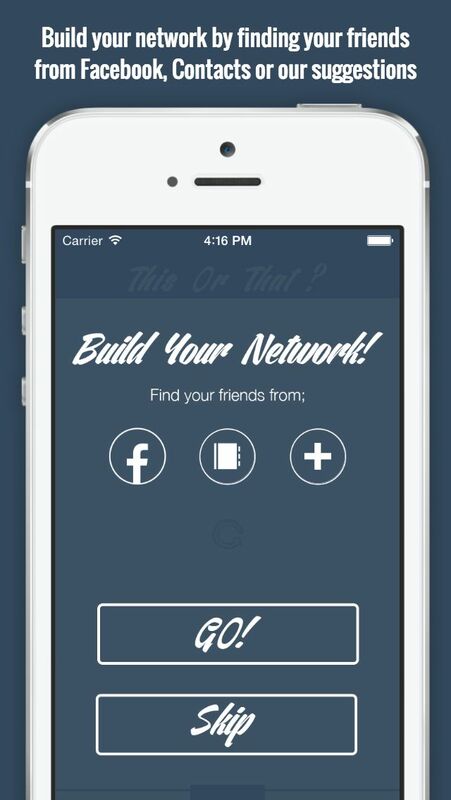 We love to play this game this or that among our friend and now we have chance to play this game via this app. I have tested beta verision of tot, now i'm impatient to have full verision of this for playing tot game with my friends via our phone. I'm using the beta version of ToT. It is really amazing and different than others. I'm waiting for live version, hope we'll meet as soon as possible. the last updates, sales, latest things and the developers’ stories. 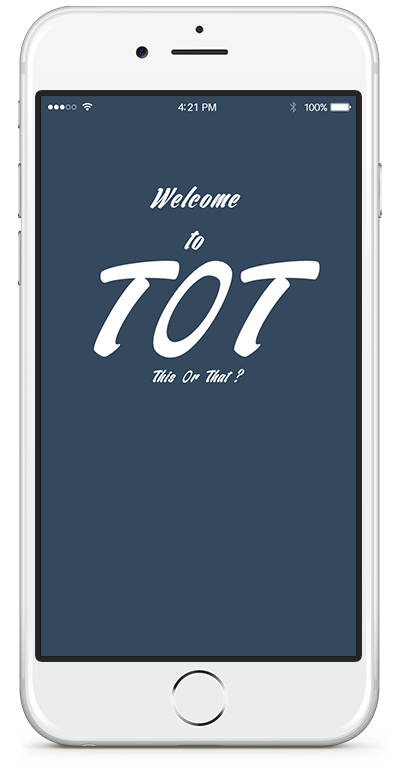 ToT app is now on AppStore! 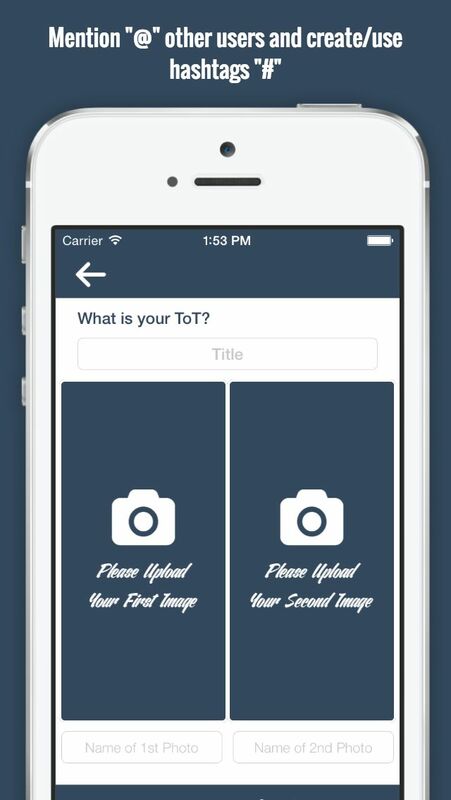 ToT app has been submitted to AppStore for review. 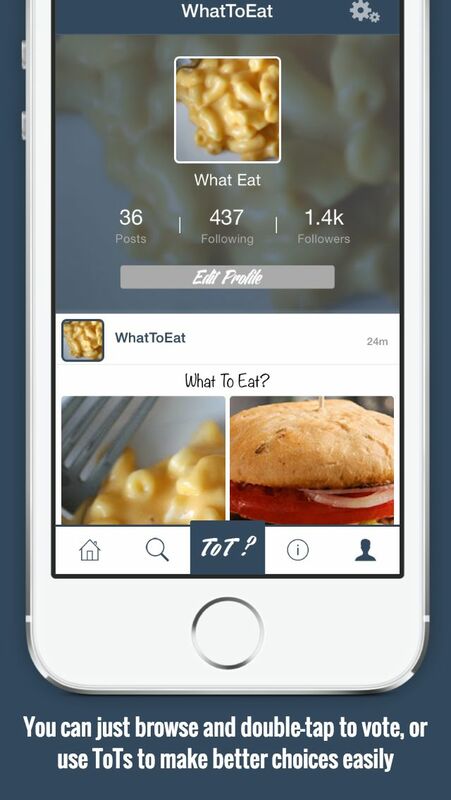 ToT joined Twitter (@theToTapp) and Facebook (/thetotapp). Android Version is in progress.